Summary: From the author of the bestselling WAYWARD PINES trilogy, a brilliantly mind-bending science-fiction thriller in which an ordinary man is kidnapped, knocked unconscious—and awakens in a world inexplicably different from the reality he thought he knew. Review: Amazing! I have never read any of Blake Crouch’s previous work but I can see myself doing so in the future. I know he was the writer of Wayward Pines and I believe that it is a TV series. After reading this by him I definitely want to give the series a go as well. 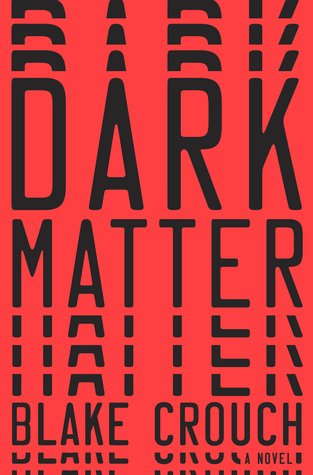 I looked this book up on Google and I found an article stating that Sony wants to make Dark Matter a movie. I hope it’s true because I’d love to see this book come to life. Especially the ending. This book was such a science fiction roller coaster in a good way. It went from mystery to thriller to some scifi fantasy. There was even a romantic undertone. It was so addictive I didn’t put it down since reading the first few paragraphs. I sat in bed for 4 hours and just read. All the different worlds colliding was such an interesting aspect. I also loved the science behind it. It takes a lot to physically (loud verbal exclamation/jaw drops) shock me while reading and this book did it to me three times with all the twists! I highly recommend you seek this title when it becomes available! Thanks to NetGalley and Crown for providing me with a copy in exchange for a review! This entry was posted in book, book review, dark matter. Bookmark the permalink. I watched one or two episodes of Wayward Pines and really liked it. I want to get it on DVD so I can actually watch the entire series. I have a feeling this one will be just as good. Thanks for putting it on my radar. I have to check it out!